The Kudzu cloth is made of bast fiber which is taken from stalk and put in order to thread. There are kudzu cloth which is made of twisted thread for warp and weft. But kudzu cloth in Enshu area (central part of Shizuoka prefecture ) has been made of cotton for warp and kudzu thread for weft. It is characterized by use of non-twisted (flat) thread for weft. Since Edo period Enshu area has been the only one area that produce kudzu cloth. 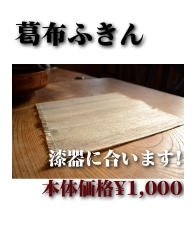 Generally they call kudzu cloth 〝kuzufu〞 but in producing area people call it 〝kappu〞 untill recentry. there is also another way to call it 〝kuzu nuno〞. 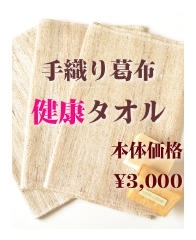 At the time of establishment our company's name was 〝Shizuoka kappu〞 and we called kudzu cloth 〝kappu〞. But it is unified in what we say 〝kudzufu〞 that enable people to recognize it simply. I heard there was cloth called 〝fujifu〞or〝fujinuno〞which was made of kudzu fiber in 〝kuzufucyo〞Tonomura Kichinosuke wrote. The cloth made of wisteria fiber and kudzu fiber were not distinguished　in old time. But there was not 〝fujifu〞called 〝kudzufu〞. Therefore I think kudzufu was belong to fujifu family. There is Fujiidera temple in Osaka. It was built by Fujii-muraji clan in the middle of the 8th century. They were the Kudara royal family's descendant came from Korea. It is interesting to know chinese character Kuzu is also called Fuji ! since 2008-02-08 / Copyright 2008 Kuzufu.com. All Rights Reserved.